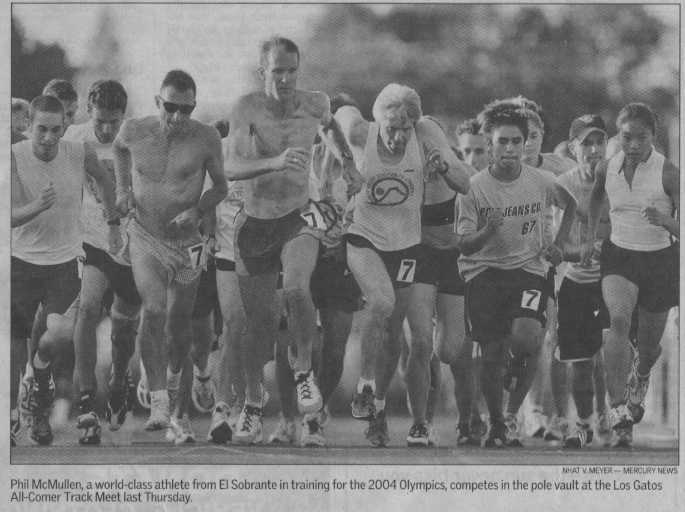 In 25 years, the Los Gatos all-comers meets have become the gathering place for Santa Clara Valley's track and field community -- for both recreational and elite athletes. Among the meet record-holders are 13 Olympians, including four gold medalists. There are not many opportunities for those 30 years past their prime to step to the starting line next to an Olympian, but it's not unusual at Los Gatos High on a Thursday summer night. All it takes is $4 and a desire to gauge your fitness level in a manner impossible at the local gym. Similar meets have come and gone throughout the Bay Area, but this one has lasted because of its superior organization and ability to make athletes of every level feel as though they belong. Of course, there are exceptions. Meet director Rick Milam recalled a 100-meter race when a male runner refused to take the starting line. ``I'm not running against a girl,'' he said. Milam, however, refused to place ``the girl'' in another heat. The man reluctantly took the line and didn't stand a chance. Ten meters from the finish, he pulled up lame. ``Oh, my hip,'' he yelled. Milam later spotted the man walking toward the concession stand -- without a limp. ``The girl,'' by the way, was Chryste Gaines, an NCAA champion at Stanford, a two-time Olympian and 1996 400-meter relay gold medalist. The meets fill a gap for those of all levels looking for somewhere, anywhere, to compete. Harmatz couldn't foresee that Andre Phillips would use his meets as a training ground for a successful run for the 1988 Olympic gold in the 400 hurdles. Or that the likes of former world-record holder and Olympic champion discus thrower Mac Wilkins and 16-time women's national outdoor distance champion Regina Jacobs would be regulars. Scott Slover, a Los Gatos resident and one of the top 10 pole vaulters in the world, chose to stay home this summer rather than compete on the high-powered European circuit. The reason: to work on his speed. He runs the 100 and 200 as part of his training. ``I could never do that if I was in Europe,'' Slover said. He's not the only one who hopes to use the meets as a springboard to greater success. Last week, Patrick Robinson, a 33-year-old sheriff's sergeant from Reno, was encouraged enough by his 1:50.94 in the 800 to commit himself for an attempt at reaching next year's Olympic trials. On the same day, two of the nation's top decathletes, Phil McMullen and Bevan Hart, worked on their pole vaulting, and San Jose City College standout Guy McGowan ran four races (the 65, 200 and two heats of the 100) as a way of keeping pace with other sprinters who have the luxury of running internationally all summer. But for most, the satisfaction doesn't come from reaching the Olympics or any other high-profile meet. It's simply from challenging themselves in a way they never have. The meets run every Thursday through Aug. 14 at Los Gatos High School. Pole vault at 5 p.m., other field events at 5:30 p.m. Running events at 6 p.m. $4 for unlimited events, $2 for spectators. Rick Milam (408) 241-6578.